Local residents vote at a polling station during the election in the city of Donetsk controlled by pro-Russian rebels in eastern Ukraine, Nov. 11, 2018. Voters in rebel-held east Ukraine chose new leaders Sunday after Russia defied Western calls not to sabotage peace talks and Kiev urged fresh sanctions against the Kremlin. In the Donetsk and Lugansk "People's Republics" in Ukraine's industrial east, voters headed to polling stations after a top rebel was killed in a cafe bombing in August. Wary of possible violence, separatist authorities tightened security, with gun-toting, camouflage-clad soldiers deployed to ensure order. Campaign posters around the Donetsk rebel stronghold called on people to vote "with Russia in your heart." Washington and Brussels had asked Russia not to hold what they call "illegal" polls, saying they will further hamper efforts to end a conflict that has killed more than 10,000 people since 2014. Kiev urged the West to punish Russia for violating a 2015 peace agreement, while President Petro Poroshenko called on east Ukrainians to snub the vote "at gunpoint." "Do not participate in fake elections!" he said Saturday. But Russia and local authorities rejected the appeals, saying people deserved a chance at a normal life and stressing that the turnout was high. "There was mortar shelling again yesterday. I was even afraid of going to vote," Natalya, who declined to give her name, told AFP at a polling station on the outskirts of Donetsk , a few kilometer (miles) from the frontlines. The 61-year-old retiree, who lives in a building with boarded up windows, said all she needed was peace and a better pension. Another voter, Lyudmila Sharakhina, said she wanted her rebel region to join Russia. "Of course, we would like to become (part of) Russia, like Crimea did," the 60-year-old said at the polling station at a school that doubles as a bomb shelter. In 2014, Russia annexed Crimea and supported the outbreak of an insurgency in eastern Ukraine in what Kiev sees as punishment for its pivot to the West. While heavy fighting is over, the conflict regularly claims lives. Four Ukrainian soldiers died over the past two days, Kiev said Saturday. Peace negotiations have reached deadlock and Western-backed accords agreed in 2015 are largely moribund. Many analysts say the polls are a way for Moscow to strengthen its grip on around three percent of Ukrainian territory where 3.7 million people live. The U.S. embassy in Ukraine said the "sham 'elections' will benefit only Russian proxies in eastern Ukraine," while NATO added the elections "undermine efforts towards a peaceful resolution of the conflict." "These are elections for entities that have no legitimacy under the Ukrainian constitution," said Kurt Volker, the U.S. special envoy for Ukraine. Last week, the European Union condemned the elections as "illegal and illegitimate ... they are in breach of international law, undermine the commitments taken under the Minsk agreements and violate Ukraine's sovereignty and law." But Moscow, which denies funneling troops and arms across the border, says the polls are necessary to fill the power vacuum after the assassination of rebel Donetsk leader Alexander Zakharchenko. While several candidates are running in each of the two regions, Denis Pushilin and Leonid Pasechnik, the acting Donetsk and Lugansk leaders, were expected to sail to victory. "We are choosing our future," said Pushilin, a 37-year-old former operator of a notorious Russian Ponzi scheme and successor to Zakharchenko. His Luhansk counterpart Pasechnik said Sunday that "we are a free republic, a free country" and denied that the voting was being held contrary to the 2015 agreement signed in Minsk. Local authorities pulled out all the stops to encourage a high turnout, setting up food stalls near polling stations and offering lottery tickets to those who voted. 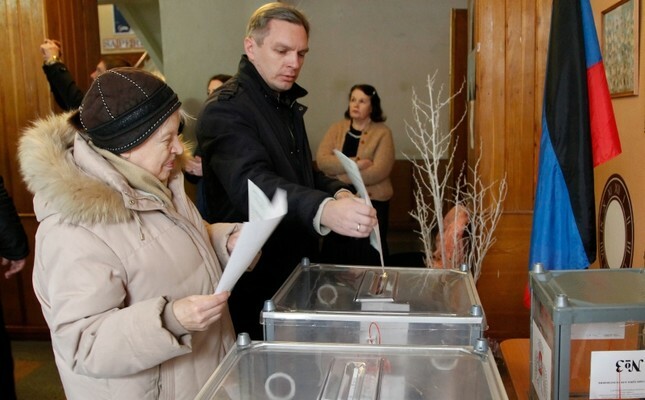 Officials said more than 60 percent of eligible voters had cast their ballots in the Donetsk stronghold as of 1100 GMT, while turnout stood at more than 50 percent in the Lugansk region. Polling stations were to close at 1700 GMT. Besides new leaders, voters were also choosing local lawmakers. Some said their opinions did not matter. "Two global masters -- the United States and Russia -- are dividing territories," said Yury, a 50-year-old Donetsk resident, declining to release his surname. Vladimir, a 36-year-old customs broker, said he did not vote, adding that he did not doubt that Pushilin would win in Donetsk. "It appears that Russia has already chosen him," he told AFP, declining to provide his surname. Kiev's Western backers say that in order to settle the bloodiest European conflict since the Balkans in the 1990s, Russia should withdraw troops from eastern Ukraine and agree to a U.N. peacekeeping mission there. The last separatist elections were held in 2014 despite protests from the West and Kiev.